Our company is known in California for our beautiful concrete structures and quality workmanship, particularly in handling decorative concrete projects. We have completed similar projects for residential and commercial properties in Santa Monica, Torrance, and Los Angeles that we can show you. Just contact us today so we can provide you our long list of satisfied clients from these areas. 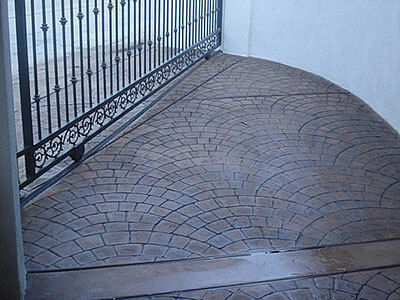 Choosing decorative concrete over other materials and techniques is a cost-effective decision. With this method, you can have beautiful floors, countertops, patios, pathways, bathrooms, and driveways at a fraction of the cost of using expensive materials like natural stones. For example, a concrete surface can be stamped, overlaid, and dyed to resemble brick, slate, limestone, slate, or even wood. It can also be stained to look like marble or designed based on your personal designs. This decorative method is applicable for almost all concrete surfaces in your home. We can use it on indoor or outdoor concrete floors and structures. With decorative concrete, you can have a spa-like bathroom with walls and floors that look like marble or granite; a living room that breathes with style and luxury with its slate-looking floor; a homey kitchen lined up with brick-patterned concrete walls; or a warm and welcoming patio stained and designed according to your specifications. We have already helped numerous Santa Monica clients achieve these dramatic transformations in their homes. You, too, can experience these if you hire us today. The secret to enjoying all the benefits of decorative concrete lies in the hands of experts who know how to apply the various techniques and use the appropriate tools and materials. We at West Coast Concrete Services have experts who are highly skilled in all aspects of concrete stamping, overlaying, and staining. We know how to build concrete structures that have the right porosity to absorb moisture yet durable enough to withstand heavy loads and frequent use. And we will ensure that you’ll have concrete surfaces that are stunningly beautiful with the various decorative techniques and methods that we can perform. Rest assured that we don’t take shortcuts but carefully prepare the area before we pour concrete and apply your desired designs. We will install control joints where necessary, feather out edges, and apply the best sealants to create seamless, durable surfaces that you can show off to your family and friends. And to create these kinds of concrete structures, we don’t use substandard tools and materials. In addition, we continuously upgrade our equipment and get materials only from reputable suppliers in the state. Why spend more for expensive flooring materials when you can get quality floors and surfaces for a much lower cost? Just call us at 310-466-4456 and we will turn your plain concrete surfaces into stunning areas with our decorative concrete techniques. We can also show you some samples of our exquisite concrete designs that have captured the hearts of our past and present clients in Santa Monica, CA and surrounding areas. We look forward to hearing from you.